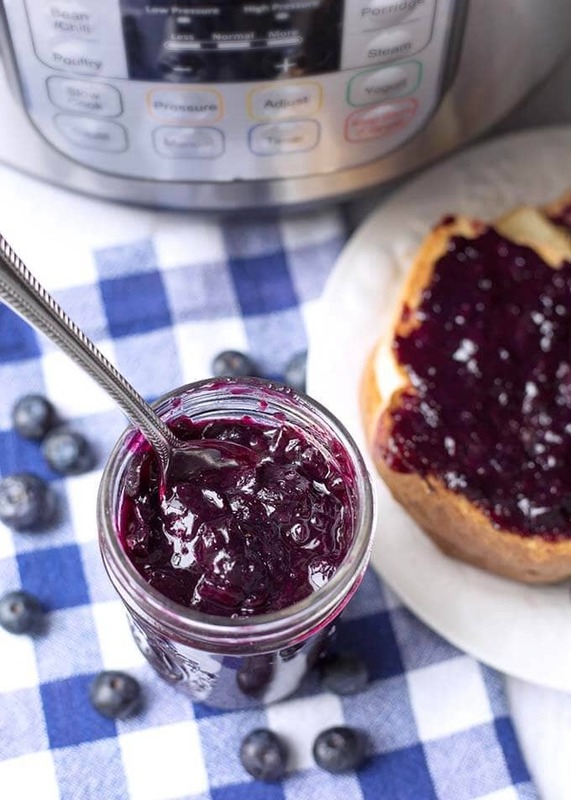 Instant Pot Blueberry Jam is fast, fresh tasting, and super easy to make. I show you how to make jam in the Instant Pot! 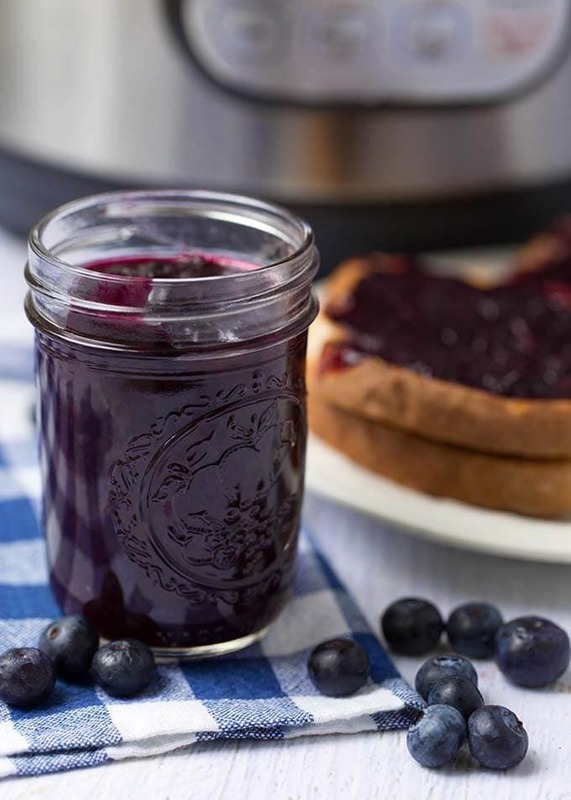 You won’t need pectin for this delicious pressure cooker blueberry jam recipe. You can use any size Instant Pot to make it. Blueberries are my most favorite berry. We grow them here in Washington, but my bushes had to be moved and didn’t produce much this year. Thank goodness we have the Pike Place Market near us! That is the ultimate farmers market! They have it all! I love blueberry jam, and have to make it homemade because I can rarely ever find it in the store. 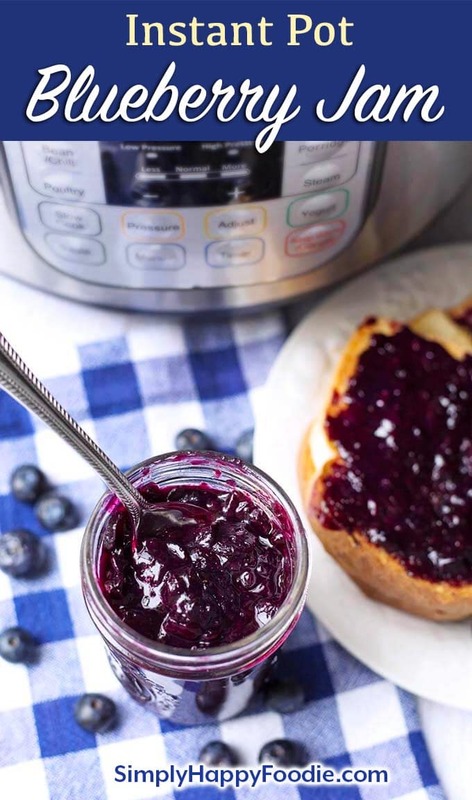 But that’s okay because Instant Pot Blueberry Jam is fresher, better tasting, and less expensive to make than store bought jams. Today my Instant Pots were busy! I made ribs in one, mashed potatoes in another, and I had my Instant Pot Blueberry Jam in my 3 quart Mini! Don’t ask how many Instant Pots I own. I’ll give you a hint, more than the three I just mentioned! Hahahaha! To be fair, I did donate one to our family’s auction to help fund our family reunion. 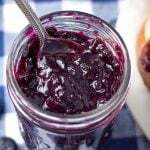 Can You Make Instant Pot Blueberry Jam With Honey? Yes! You can use honey if you want to. I like to use good ol’ sugar to make my jam. For my taste, I have found that the honey changes the flavor of the blueberry jam and adds a floral note that competes with the berries. Now, that could just be the type of honey I have, which is a local raw honey. 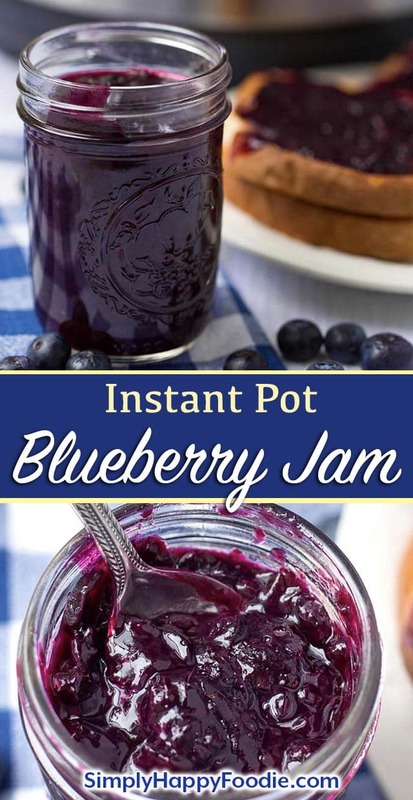 If you want to use honey in your Instant Pot Blueberry Jam, see the Notes section of the recipe card for how to do it. I like to use my Instant Pot Blueberry Jam on toast, of course, but also on cheesecake, in Instant Pot Yogurt, or even as a cake filling! 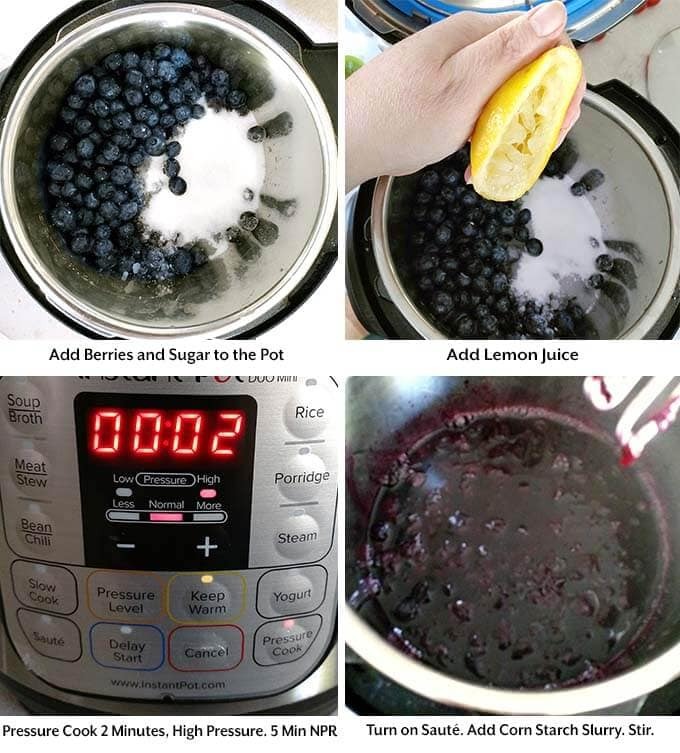 Put the blueberries, sugar, and lemon juice in the pressure cooker inner pot. Close lid and set the steam release knob to the Sealing position. Press the Pressure Cook (Manual) button or dial and then the +/- button or dial to select 2 minutes. High pressure. It will take a few minutes for the pot to get to pressure. When the cook time is finished, let the pot sit undisturbed for 10 minutes (10 minute Natural Release). Then turn the steam release knob to the Venting position and release the remaining pressure/steam. Turn the pot's Sauté setting on to the LOW temperature. In a small cup, mix the corn starch and water together until smooth. Set aside. When the contents starts to simmer, stir and cook for 5 minutes to reduce it a little. Add the corn starch slurry into the jam and stir. Cook a couple more minutes until thickened. Turn off the pressure cooker and use silicone mitts, or a good set of pot holders to remove the inner pot to a cooling rack. Then give the jam another stir and leave it to cool. When cooled, transfer to small mason jars with lids, and keep in the fridge for up to 2 weeks. 1. Pour the honey into the pot first. Set the Sauté setting to the LOW heat. Gently warm up the honey so it becomes thinner. 2. Then add the berries and continue with the recipe as written. I have noted the changes in amounts of other ingredients when using honey. 3. Much of that is because honey increases the liquid, so you will want to decrease the water for the slurry a little, and increase the corn starch a little. 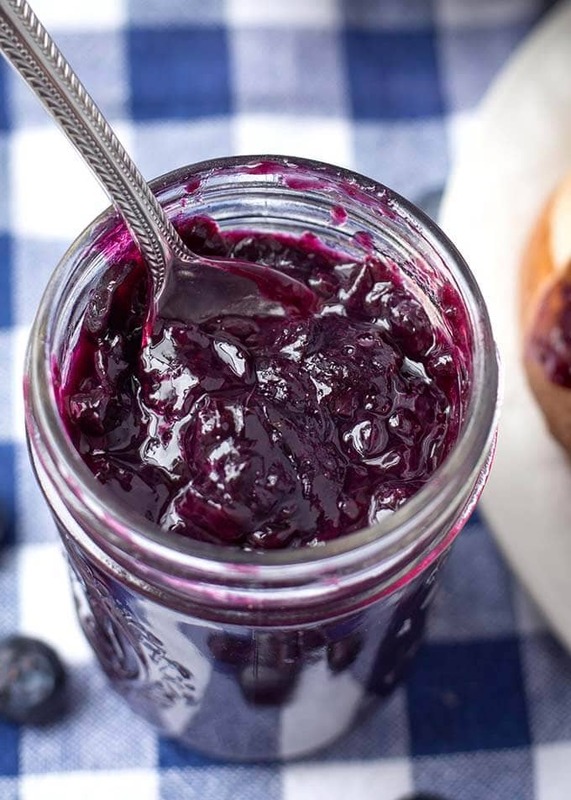 Thank you for posting this blueberry jam recipe. I had a lot of blueberries to use up and saw this recipe so I made a batch. It was so easy. I used sugar like you did and that is how I like it. Tastes really good too. Hi Ellen! Wow, you must have seen this right after I posted it this afternoon! Thank you so much for your review. I’m happy you like the jam! I made this today and it turned out perfectly! This will be nice for our toast in the morning. That’s great, Kerri! So glad you liked it! Sure! Just make sure your jars are freezer safe. Leave a little room in the jar for expansion. Thank you for posting this- I can’t wait to dive-in with my blueberries! Just a quick question with the corn starch: is the slurry made in a separate, non-heated bowl? I’ve never seen a recipe post so quickly through Pintrest, and I am super excited to try this as my first jam! Thank you for taking the time to respond! Hi Laura, yes it is. I have it in step 5 of the instructions, and I made the wording clearer so people won’t wonder. Thank you for your question! I hope you like the jam! Hi Mallory, I don’ tsee why not. I haven’t made a large enough batch to can, but it should be fine! If you choose to can this, use commercial lemon juice. Lemon acidity varies from one lemon to the next and you need that consistent acidity that commercial juice has. Process for 10 minutes. Hi Deb, this is not a canning recipe, it is a small batch meant to be kept in the fridge. Simply delicious! Had it with our toast this morning! Thanks for posting! That’s great, Susan! I’m happy you liked this recipe! Thanks for your review! How many cups of blueberries is 2lbs? Can Splenda sweetener be used instead of the sugar? Would use of agave need to follow honey instructions? I think it could be done, but you will want to look up the equivalents so it turns out the way you want it to. After you refrigerate, can this be store on a shelf, or should it be kept in the refrigerator? Hi Bev, you will need to keep this refrigerated. Do the blueberries need to be thawed first if using frozen? No, They will thaw in the process. Can I use pectin instead of the corn startch? Tried this recipe, exactly as written and it came out perfect! Planning on making it again soon! That’s excellent! I am so happy that you liked this! Thank you for your review! I was wondering if you could pressure cook these straight into mason jars? We just picked 4 gallons of blueberries and I wasn’t sure if I had to cook this in the pressure cooker first and then cook again in jars to seal or not? I wouldn’t, though I suppose it’s possible. You would still need to can them the traditional way. Unless you have the Instant Pot MAX, which is the only model approved for canning. Can I skip the lemon? Is this to be cooked on HIGH pressure? Hi, is this to be done at HIGH pressure? I used 11oz of blueberries and cut sugar in half. I got BURN error. I added 1/4c water and started again and the blueberries never broke down and it was watery. I added a little more blueberries and restarted 2 more minutes. That is a lot of water. You can drain out most of it before mashing the berries. Maybe try adding the sugar last and not stirring before pressure cooking. Really delicious! I used Splenda instead of sugar and it turned out perfect! Thanks for the recipe! Could I use frozen raspberries? Sure, You may need to adjust the corn starch, but how yummy!